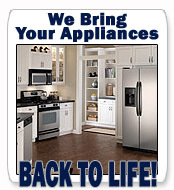 A1 Appliance has it all--professional service, a courteous staff and a finely tuned family-oriented business not often seen in today's business culture. Our washing machine was repaired immediately--replacement parts were on hand in the service vehicle. I highly recommend A1 to anyone. They quickly solved our problem, at a reasonable price. Hi my name is Malvika from Passaic, and i would like to THANK YOU .. A1 appliance for doing the best job in repairing my Amana refrigerator. My refrigerators defrost stopped working Thursday and i called just about every technician i can find however, either their appointments were couple of days later in the week or they charged an arm and leg just for inspection. I called you guys and I had someone come to my house within the hour. Your technician was very knowledgeable, courteous, and helpful.. I would highly recommend you to Everyone I know. Good Luck with your Company. and Thank you once again.